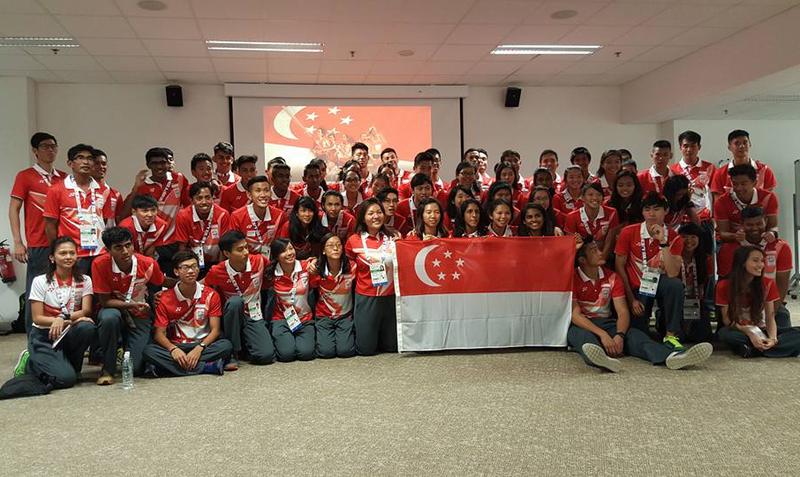 31 May 2015 – Singapore Athletics’ 28th SEA Games Singapore 2015 bound athletes woke up bright and early on Sunday morning to gather at the Singapore Sportshub for a final gathering before movinginto their home for the next two weeks, Swissotel The Stamford. The team was briefed by Assistant Team Manager Morales Menon before Vice President, Training and Selection, Mr C. Kunalan shared his invaluable experience of his past competition experience. Of particular highlight was his experience in the SEA Games held in 1973 when Singapore was the host nation. Next up was team bonding exercises lead by the appointed team captain Kenneth Khoo, who was ably assisted by Dipna Lim Prasad, Hannah Lee and Soh Rui Yong. The team were then made to reflect and give their suggestions about their desired take home from the Games, be it as an individual or as a team. A recurring theme during these discussions was mutual respect as well as cheering on your team mates. Of course there had to be Singapore’s favourite pastime on the menu, as lunch was served at the Nila Suite for Athletes, a place that allows athletes to wind down and enjoy some karaoke, foosball, pool and even massage chair facilities before, during and after their competition. For Hannah, it was a nerve wrecking experience to help lead the icebreakers but it all came good in the end. As for long-distance runner Rui Yong, he too was all smiles and relieved that all his teammates enjoyed the session, that has set the tune as they begin focusing on the task at hand. The Track & Field events for the 28th SEA Games Singapore 2015 will start on 6 June 2015 and will be held till 12 June 2015. Entry to the East Coast Park for the marathon and race walk as well as the National Stadium for the track and field events is free. Do come down to support our Team Singapore athletes!